The Full Crow Moon on Sunday March 12, 2017 is at 22 degrees Virgo. The Full Moon March 2017 astrology reveals an increase in recent tensions. To read the full article and Click Here. The full moon in March has many different names due to its signifying changing from winter to spring. It’s Time to Set Yourself Free from the Restraints of Winter and Swim to the Moon! Full Moon: March 23, 8:01 A.M.
Winter Retreating – the Beginning of Springtime! Use this extra Full Moon energy to make the necessary changes in your life. The March 23, 2016 full moon is called Crow Moon, Worm Moon, or Storm Moon. The ruling sun sign is Aries, which gives us a full Air moon in Libra. The full moon in Libra is an ideal time for ceremonies and rituals to promote friendship and working with others. You can use healing rituals if you have had problems with family and friends. Visualize your life and relationships in balance as Libra is the sign of justice and balance. 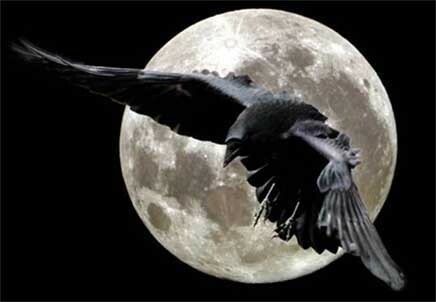 The Native American full moon names for March are largely based on these being considered the last full moons of winter; the crow caws its farewell to the season. The more northern tribes knew this Moon as the Full Crow Moon, when the cawing of crows signaled the end of winter; or the Full Crust Moon, because the snow cover becomes crusted from thawing by day and freezing at night. I feel that all full moons are a special time for us to connect to the Great Spirit as well as the moon. Do something special in honor of this full moon.